ITV4’s new weekly series The Cycle Show (right) got pedalling last night, promising to cover all aspects of the bike world from road racing to commuting. You can watch it for the next few days on ITV’s player. Top Gear for bikes it certainly isn’t. The microbudgets of fringe TV see to that. No joshing MAMILs racing each other on butcher’s bikes down the Bolivian Road of Death here. 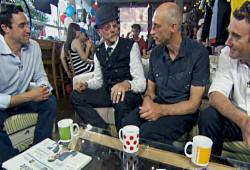 Instead what we got was a slightly awkward chat, filmed in the cut-price venue of London’s cool-cycle-cafe par excellence Look Mum No Hands, largely between affable presenter Graham Little and Nigel Mansell, F1-champ-turned-cyclist. The world’s Second Greatest Living Manxman pronounced on the historic achievement of Sir Bradley, Team Sky, Cav (the First Greatest Living Manxman), and that wossname bloke who came second. He skipped through the gears of sofa-TV cliches - awesome, incredible, amazing... er... awesome – without ever managing to engage one of them. Graeme Obree was also on the upholstery. I have a great affection for the clock-beating Scot, whose battle with demons - entertainingly portrayed on film - may be familiar to many of us. His double-espresso exploration of the sofa space – often leaning forward to hear what was being said over the hubbub from the cafegoers behind – provided a nice counterpoint to Mansell’s instant-coffee blandness. It was good to see footage of Obree’s latest speed bike, a contraption which looks frankly frightening. Though if you’ve stared down the abyss, as Obree has, then having mere high-speed tarmac two inches from your nose may feel relatively benign. The special guest on the squashy seat for the second half was Gary Fisher, godfather of mountain biking, looking scarily like the magician-grandfather in a Disney flop. He said some pleasantly positive things about not very much, and the programme ended with the bizarre sight of Obree and Fisher racing each other on sprint machines. Obree won, by a whisker, the way he glanced round near the end engagingly suggesting that he was ensuring victory over the plucky (and extremely fit) Mr F by only a small, diplomatic, margin. He’d even sported a pair of comedy Wiggo sideburns too: hats off, Graeme. Their views on safety summed up the difference between Mansell and Obree. Always wear a helmet, said the now unmoustached one glumly. No: wobble a bit, suggested the animated Scot with a sly smile. Drivers will give you a much wider berth. Must say, I think that’s nearer the mark. Anyway, two film reports complemented the coffee-table banter. A group of road bikers did the Box Hill circuit that’ll feature in the Olympics, half-heartedly giving us an idea of how basic racing tactics work; and a commuter gave us ‘safety tips’ for London. They were adequate as far as they went, which was just about up to the lights. But such things need money, and the budget for producers Century TV must be as squeezed as a York cycle lane. Nevertheless, the first programme was like an energy bar when you need a sandwich: a well-meaning sugar rush that left an empty stomach. 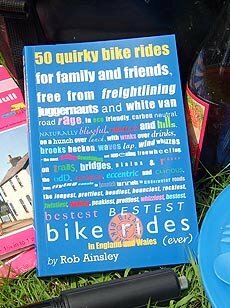 Perhaps the biggest challenge is that cycling is an outdoor thing; the opposite of sitting on a sofa and watching a telly programme with people sitting on a sofa. We got rather a lot of that and it didn’t always make for inspiring viewing. I’m happy to give it another watch next week, it might well improve, and I’d like to think a weekly programme could become a must-watch for bike fans. But cycling on TV is not an easy ask. The subcultures – commuting, racing, touring, weekend leisure etc – can have little crossover, and the only ad money is in flogging high-end road kit. Chain Reaction sponsor the series and good for them, but Century TV’s task in making the series is challenged by high expectations from a diverse and demanding audience, and tiny budgets. I think you are being very kind in your review, Rob. I thought it was pretty dreadful, actually. I really did struggle to hear the presenter and guests over the noise of the cafe, and the film packages were very poor. To suggest that a "bike safety check" consists of trying the brakes whilst stationary and taking a glance at cleary brand new tyres for "signs of wear" is, frankly, not good enough. Big budget or small budget (and I accept it's probably the latter), they could have done better. I accept also that only having a half hour slot means they have to rush stuff, but really... Like you, I'm prepared to give it another watch in the hope that those involved hit their stride, which I really hope they do, as I would be very interested in a well made TV show about cycling. It doesn't know what it's trying to be yet, and does rather look like the unfocused result of some aspirational programme planning meetings. Good that it's here at all, I suppose, but I do rather fancy that, pooling the professional expertise we have on our Facebook contacts, we could have done rather better... and Gary Fisher does spook me out! Rob, great post that compels me to catch it on ITV Player for better or for worse. This would have otherwise passed me by completely! I enjoy cycling, but it bored me. Watched Nigel Mansell and that was more than enough. I doubt I'll watch another. "Mansell’s instant-coffee blandness" had me tweeting rather than watching but Graeme Obree saved it all. The wobbly advice was classic. Gary Fisher is someone I have huge admiration for but had to make myself forgive him for mentioning Trek in his first breath. After that it was a study in the dumbing down of UK TV. Maybe that's the right thing to do if you want a big audience. Enthusiasts will watch anyway and converts may start to tune in. Who knows, but personally I'd like more depth. Quality over quantity and that's nothing to do with finances, it's about creativity and editorial decisions. Having said all the above a cycling show is a GOOD thing and negativity is not, so thumbs up for now and big hopes for the future. Remember there are people and kids out there for whom this is a whole new world of cycling to discover. I must agree with Sue, Rob, you were definitely being over kind in your review. I can understand everyone wanting to lavish praise and admiration on Wiggo, Cav and the rest of Team Sky but to devote nearly the entire first half of the show to this was overkill in the extreme. Bearing in mind the show is only 22 minutes long once the adverts are cut out this is an exceptional waste of precious TV time which a show like this cannot afford to do if it is to continue. To follow this up with a 90 second safety video clip which was quite frankly crass in the extreme "I like to have my helmet at a jaunty angle"? beggars belief. Ok, there were some redeeming features - Greame Obree's mean machine looked great and his "look wobbly" advice was priceless but these moments were too few in an otherwise bland program, not helped by Graham Little's presenting style or ability to engage his guests. I will give it another go next week but The Cycle Show in this format is on borrowed time I fear unless it improves overall. This was no more relvant to real cycling than Match of the Day or One Man and His Dog. ...so obviously it *is* relevant to real cycling. Don't know about Match of the Day though. I thought the most intelligent part was Graeme Obree proving that sideburns make you go faster. Some of the safety stuff was distressing, all of their statistics were wildly innaccurate. The bike check advice was useless. I can understand that for their sponsors they have to pretend that helmets and gloves are essential but they could have at least have had one shot showing normal (majority) cyclists not wearing helmets. The advice from Gary Fisher and Graeme Obree was good but destroyed by Nigel Mansell whose only qualification is that he recently crashed and broke a collar bone, no wonder he thinks that wearing a helmet is the most important thing. A new series has just started. I'm just going to turn it off now. Obviously, driven by the sponsors, it's depressingly like magazines such as Cycling Plus and Cycling Active. It's targeted squarely at MAMILs and getting them to part with as much money as poss' for road bikes, mountain bikes and all the gear (including helmets). Not much for day-to-day cyclists, commuters, etc. 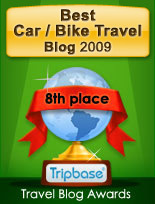 For those who think cycling is a "sport", not a handy way of getting from A to B.